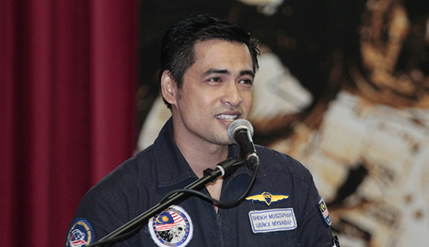 BANGI, 30 Oct, 2012 – Malaysia’s first and only astronaut Datuk Dr Sheikh Muszaphar Shukor Al-Masrie hopes that the next Malaysian in space will be a woman who will do useful scientific research. Datuk Dr Shiekh Muszaphar told some 200 school children that the next Malaysian astronaut be a scientist tasked with doing useful experiments for a longer period at the International Space Station (ISS). Speaking at a Public Lecture at The National University of Malaysia (UKM) today, along with American astronaut, Dr Daniel T. Barry, he said it is important that the next Malaysian astronaut will not be perceived as someone who will perform gimmicks which have no scientific value. The lecture on Reach For The Stars was organised by UKM’s Institute of Space Science (ANGKASA) and the Malaysian Industry Government Group for High Technology (MIGHT) in conjunction with the Second Inter Sessional Meeting of The Global Science and Innovation Advisory Council (GSIAC). He is Principal Fellow at ANGKASA. When asked whether the next astronaut should be from UKM, Datuk Dr Sheikh Muszaphar said that it did not matter to him from which university she comes from. What is important is that the priceless opportunity to go into earth’s orbit be used wisely and not seen as trivialising the importance of exploration. The amusing things that appeared in video was the result of the weightlessness in space and not done for entertainment. As an example, Datuk Dr Sheikh Muszaphar was dissapointed that his space trip was widely touted by the local media as an opportunity to make teh tarik, or play congkak. He explained that he did none of those things because he had more important things to do during his eleven days in space. He said he wants to inspire legions of schoolchildren to literally reach for the stars by starting out with the best education they can achieve, preferably in science. The Angkasawan programme, among other things helped local scientists develop their experiments on protein crystallisation, an effort that continues to this day. It is vital, he explained, that youngsters aim high and not be overwhelmed by the huge scale of the effort. Asked about his budding movie career, Datuk Dr Sheikh Muszaphar said he is excited to be starring in a space adventure film based on his own experience in outer space. The film, titled ‘N01 – 10 HARI: 21 JAM: 14 MINIT DI PINTU AJAL’, is to be screened in cinemas in March next year. The film directed by Imran Ismail of ‘Jalang’, ‘Datin Ghairah’ and ‘Cassandra’ fame will comprise a combination of computer-generated images, three-dimensional images and footage recorded by him in outer space. Malaysia joined an elite group of only 39 countries to send a man to space when Datuk Dr Sheikh Muszaphar became part of the Russian Expedition 16 in October 2007.